Sweetwater County residents will have an opportunity to meet new University of Wyoming President Laurie Nichols during a public reception Thursday, Aug. 11, in Bunning Hall at the Freight Station in Rock Springs. The event will begin with a 6:30 p.m. community hamburger barbecue, followed by a 7 p.m. “meet-and-greet” and then 7:30 p.m. remarks by the president. There also will be an opportunity to ask her questions. The Aug. 11 event is part of a trip to Sweetwater County that will include a stop at Western Wyoming Community College in Rock Springs to meet with faculty and staff members, and a meeting with members of the WWCC Board of Trustees in Green River. During her first months in office, Nichols has been spending a day or two of each week traveling around the state to meet with citizens, community college and public school leaders, legislators, alumni, media and others. Nichols came to UW from South Dakota State University, where she has served as provost and executive vice president since 2009. Before that, she was dean of the SDSU College of Education and Human Sciences from 1994 to 2008. 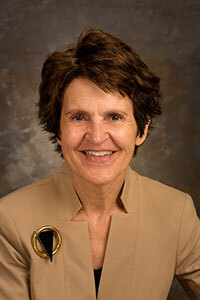 She began her career in higher education as a member of the faculty of the University of Idaho from 1988 to 1994.